The Nesland family farmhouse has seen four generations of Neslands (one technically Timper) grow up within its walls. I spent a majority of my childhood at the farmhouse with my grandparents and to this day I still work on the property fixing it up. Thankfully my parents purchased the farm from my grandfather and it remains within our family. As far as memory goes, both sides of my family have lived in the state of South Dakota. So when, as a newly graduated and married couple my parents decided to move to Seattle, they were traveling as far from family as anyone remembered. Even so, I was able to know most of my extended family– all except my maternal grandfather, pictured to the right. All I knew was from stories or from newspaper clippings. 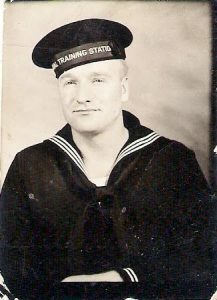 He served in the Second World War, and like many vets, he didn’t tell many stories of his time in the Pacific Theater. 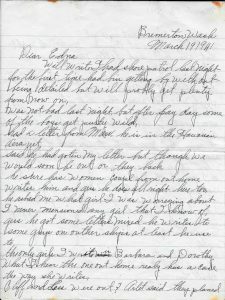 Recently, m y mother’s cousin rediscovered letters that he had written to his sister during the war. It was incredible to read what he told her– of feeling homesick while based in Hawaii, and how training was going in Bremerton, Washington. My mother never realized that he had been stationed in the area until we were reading those letters together. Suddenly, my family history did not feel quite so far away. Even though I never met him, it seems my grandfather and I have overlapped in even the smallest of ways. Listen to my story here! My digital story telling project is based on the music i’ve been collecting and how it can hold memories, feelings and stories from my life. When I remembered that I enjoyed road trips. For my digital story I decided to discuss the results of a DNA ancestry test that my sister took. Even though siblings don’t share the exact same genetic make-up, I knew that I could learn a lot about my heritage from her results. My digital story is about my great grandparents and my grandparents, and the heirloom that keeps that keeps them close to me. My digital story is about my older brother, Christopher. He is 11 months older than me, and has been developmentally disabled since birth. When tasked with creating a digital story about something personal, my first thought was my life in terms of my greatest passion: art. This video helped me to look into the different stages of my life through the art that I have created. I hope you enjoy and look at the ways art impacts your own life. I found some interesting pieces of information about my mother’s side, but I could not find much about my father’s side. In Africa, the written records do not go back too far. Dancing is very important to my family, so I decided to do a short piece on the history (and future) of congolese dancing. Enjoy!